Published on Sunday, April 21, 2013. 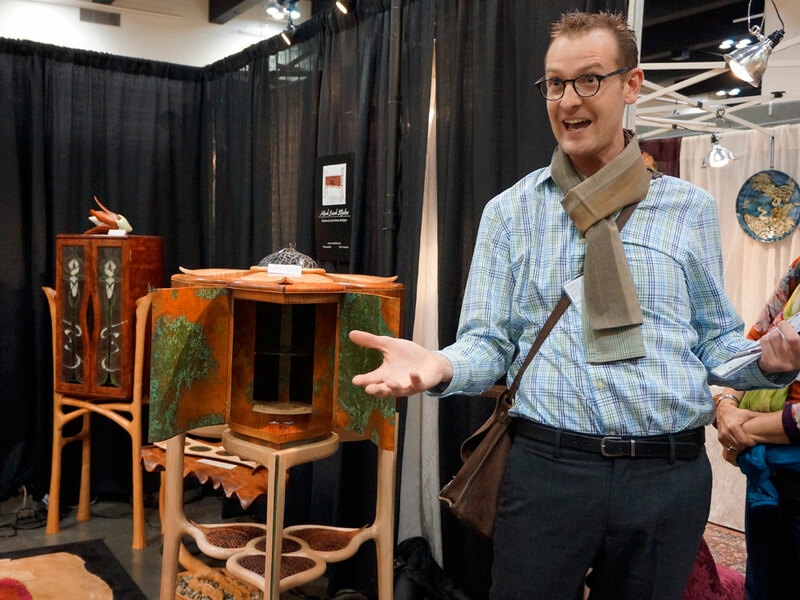 The snow was coming down on Friday, April 19, in St. Paul, but fine craftsmanship and extraordinary design were on the rise at the American Craft Council show! Friday afternoon was the announcement of our Awards of Excellence (AOE), which were presented to three outstanding artists for quality of work, and one artist for exceptional booth design. The work of these four artists represent some of the finest examples of contemporary craft found in the United States. This year's AOE juror was Scott Pollock, director of exhibitions, collections, and programs at the American Swedish Institute in Minneapolis. 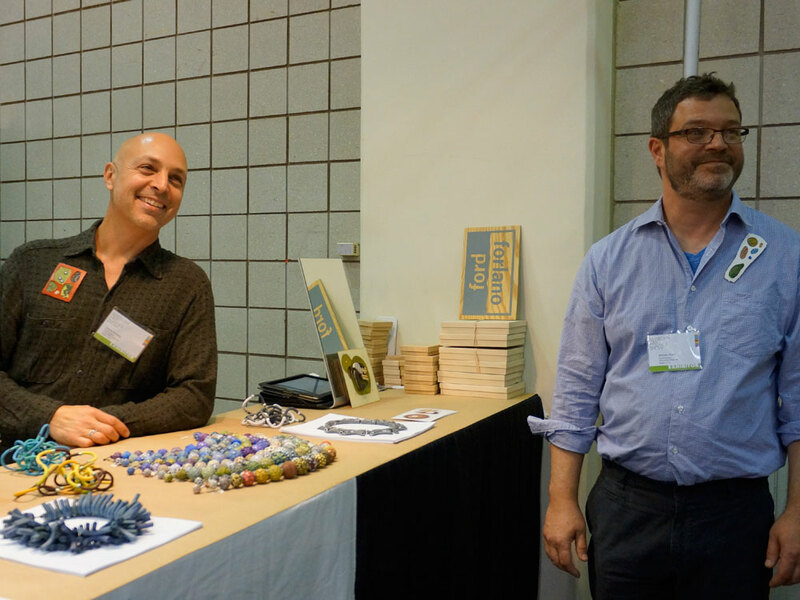 Many ideas and projects become even better when developed in a group, and the dynamic jewelry of Steve Ford and David Forlano (booth 1212) is no exception. Known professionally as ford/forlano, these two longtime friends live in different cities (Philadelphia and Santa Fe) and their method of "swapping" works, with each artist adding their unique talents to a piece of jewelry, results in a finished product that is colorful, fluid, and fascinating in its exploration of the three-dimensional object. David Forlano's expertise is in color, pattern, and surface, while Steve Ford focuses on structure; together, their talents create pieces that never fail to astound. Mark Laub (booth 401) is the most local of the award winners at St. Paul. A wood artist, his finely constructed cabinets, tables, chairs, and other furnishings are indicative of the close connection that many Minnesotans have to the beauty of natural world. Juror Scott Pollock was drawn into Laub's work by the intricacy of each object and high attention to detail. Each of Laub's cabinets, with their array of doors, panels, and decorative elements, reminded Pollock of historic wunderkammern, or cabinets of curiosities. 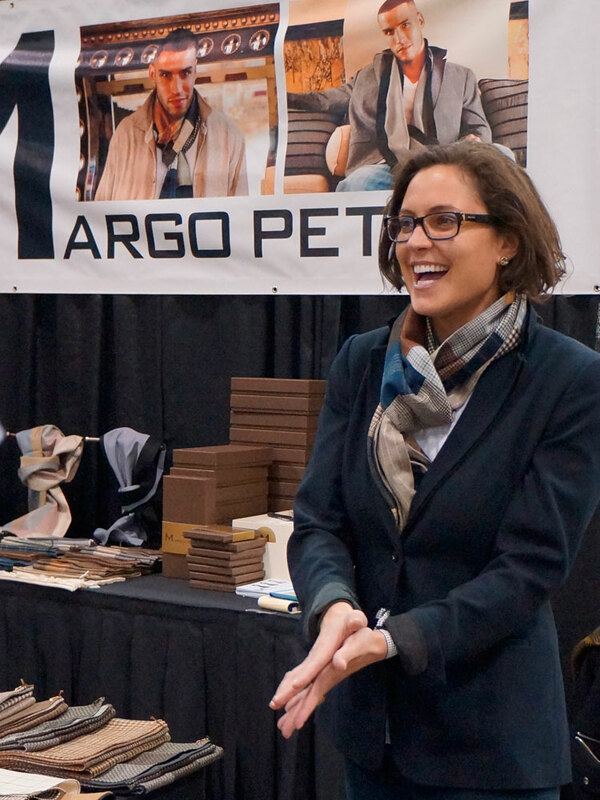 Margo Petitti (booth 521) is championing the return of the well dressed man in America. Her expertly crafted scarves and pocket squares-made from Italian wool, silk, and cashmere-present fine fabrics in an updated style. Perfect with jeans or making that suit jacket look extra sharp, Margo Petitti's patchwork designed accessories are a wonderful balance of classic and contemporary. 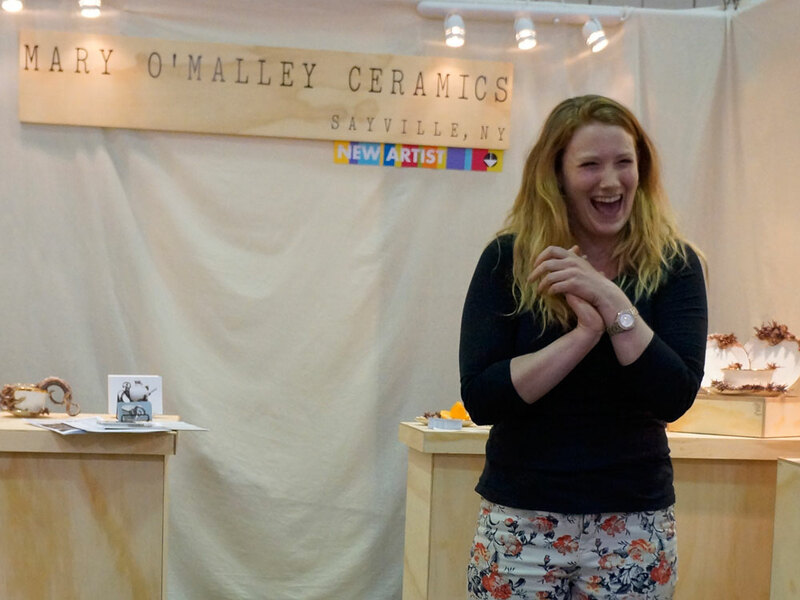 Taking a victory lap after claiming the Hambidge Residency Award at the ACC Show in Atlanta, Mary O'Malley (booth 1206) received the booth design award for her wonderful display, which highlighted and complemented her "Bottom Feeders" series of porcelain. Inspired by sea life, O'Malley's teapots and cups take on organic forms that seem to have come straight from the ocean depths. Her clean and simple display, using neutral wall colors and plywood for pedestals, allowed booth visitors to be drawn into O'Malley's well curated collection of porcelain. Simple, clean, and perfectly balancing the organic and unexpected forms of her work, Mary O'Malley's booth is deserving of the award. Congratulations to this year's AOE winners in St. Paul, and to all the artists who made the show a success!